This evening I started getting contractions. They weren’t too painful and they weren’t consistent. I told Bryan that I assumed they would hurt a lot more so I wasn’t going to worry about them too much. I didn’t do much this night. Took it easy and stayed horizontal for most of the evening. After a very restless night of sleep and multiple trips to the bathroom, I slowly made my way into work. Arriving about 30 minutes after I should have been there, I started my day with the intention of not staying through the afternoon. My one goal – get things wrapped up that morning. My first contraction of the day was around 6:30. It wasn’t much different than the night before so I continued on with my day. At 9:17 I had my first “major” contraction. It was major enough to make me stop and grab a piece of paper to write the time down. The pain still wasn’t what I thought it would be, but it was more than the night before. I went 21 minutes, 17 minutes, and 15 minutes in between contractions. Around 10 am I called and told him to reschedule his afternoon meeting because I didn’t think we’d still be in town. I told him they were consistent but not too painful. I had a few things to finish up and then I was leaving. At 11:30 I cleaned up my office in case I wasn’t returning and left. When I got home I packed my bag and headed to the couch. I rewrote the contractions in my notebook while snuggling with Wrigley on the couch. brought lunch home and I proceeded to eat a few bites. I was worried that they wouldn’t let me eat later that day, but I couldn’t bring myself to eat. Bryan ate his lunch and packed his bags while I grabbed last minute things. The contractions had intensified a little. It was enough that I had to stop what I was doing and breathe through the pain. By 1 pm the contractions were about 10 minutes apart. The pain had increased from my back and stomach to part of my upper thighs. I called my doctor in Ames and told her what was going on. She said they were still kind of far apart for early labor but it was my decision to come over. I knew she was going on vacation that afternoon so I said we’d be there about 2. On the drive over, the contractions increased to about 6 minutes apart and sometimes 3. Traffic was pretty heavy for a Thursday afternoon but the drive went pretty quick. I got to the office and saw my nurse when I walked in. They didn’t have any rooms open so I had to sit in the waiting room for a little while. I went through about 2 contractions while I was in there and the room was packed! Finally, I made it back to a room and my doctor checked me and I was 100% effaced and 3 cms. She said it was our decision if we went over to the hospital or if we waited a while. The process was that they would monitor the contractions to see how they were and watch the baby to see how he was dealing with them. Once they started monitoring me, I wouldn’t be able to leave. We decided to go over because I wasn’t going to be able to do anything else around town. We got to my room at 2:50. A nurse hooked me up and started monitoring my contractions and the baby’s heart beat. She reassured me that he was handling the contractions very well and his heart rate wasn’t dropping too much when I was going through them. I labored on my side in bed for awhile. In between each contraction Bryan gave me water so I could make sure to use the bathroom each hour. Around 4 I got up and used the bathroom. On my way back to the bed, my nurse grabbed an exercise ball and I stood up through a few contractions. During each contraction Bryan massaged my lower back and helped ease the pain. Around 4, my nurse checked me and I was 6-7 cm. She talked with my doctor who had called to check on me. She told me the doctor on-call and midwife on-call and asked who we’d prefer. Even though I was going for a natural, medication free birth, we decided the doctor would be best. Sometime during this hour I experienced the “transition” of labor. I was no longer able to calmly breathe through contractions. Instead I started moaning a little during the peaks. Because of the way I was reacting to the contractions, my nurse had the doctor come in and introduce himself and check on me. Unfortunately he had a different idea of the cms and told me I was about 6-7. She had just checked me and figured I was about 8. My water hadn’t broke yet, but with each contraction I felt like it was barely intact. My contractions were a few minutes apart and had changed again. I experienced one with immense pressure and then another with no pressure. My nurse urged me to ride along with them as my body was getting those last few cms out of the way. The pressure was the baby moving down. Every pressure-filled contraction, I concentrated on the baby. Knowing that he was the result made it easier to get through those contractions. Sometime after 5, he asked if I wanted my water broke. If he did that it would speed up labor and my contractions would probably intensify. I agreed that he should break it because I thought it was pretty close anyway. Quickly after he broke my water, my body went into push mode. I was thankful for an amazing nurse who told me what was happening to my body when things changed. When this first push came on, I opened my eyes and looked to her for help. She explained that it was natural, but to let my body do the work. Sometime before 6, he checked me again. He said I was fully dialated and asked me when my last ultrasound had been. I don’t remember answering, but Bryan tells me that I told him it was at 20 weeks. They determined that Maximus was breech. I was told to not push with my body. They hadn’t let me push yet, but it was a lot harder when I knew I couldn’t and shouldn’t. My contractions were about a minute apart so we had to move fast. 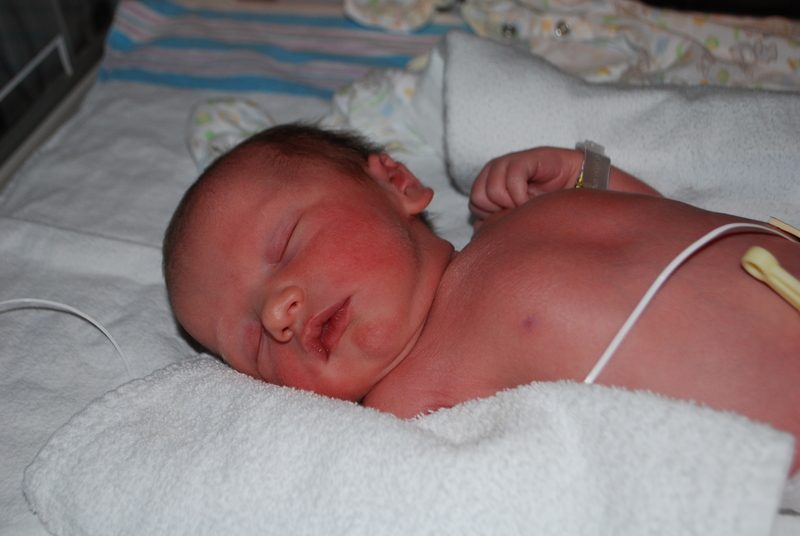 He gave us the choice to try and deliver breech or do an emergency c-section. We both agreed that c-section would be the safest way to go. My nurse grabbed the phone and started shouting orders. The OR needed to be prepped for an emergency c-section and the patient needed everything. Because I didn’t have an epidural, I didn’t have an IV. My room turned into a crazy house as people rushed in with OR gear on. Everyone was doing something at the same time. Reassuring eyes were helping coach me through the push urges my body was going through. The only way I could cope was to scream through the push portion and then breathe through the rest of the contraction. All at once, someone was putting an IV in me while someone else put a catheder in. They threw scrubs at Bryan and unlocked my bed and moved me to the OR down the hall. Because I was medication free, I didn’t have an epidural line in my back so they couldn’t go that route. Time was also an issue and they couldn’t wait for something to kick in. They strapped me to the table and gave me a general to knock me out. Bryan moved to an observation room and watched them cut me open. After they pulled Maximus out, a nurse grabbed him in a football hold and kicked open the door and ran past Bryan to the nursery. They sucked the fluid out of his lungs and gave him a clean bill of health. They told Bryan later that it had taken a little longer than normal because Maximus had started moving down the birth canal. I was in the recovery room for about 2 hours. Bryan sat with Maximus for a while and then sat with me. Around 9 pm I was taken back to my room and I met my son for the first time. This entry was posted in birth, Pregnancy and tagged birth story by Kyley Leger. Bookmark the permalink. It’s too bad that your birth plan wasn’t able to be used; but, similar to what you said in a previous post – Maximus is here now, and you and he are both healthy, and that’s what really matters! Congrats Leger family. Maximus Arthur is a gorgeous baby. Cheers – looking forward to seeing you around here again!